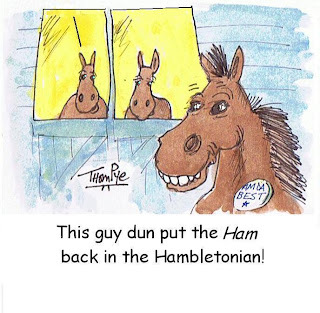 We hope those of you who took part in the Hambletonian-day Players’ Pool had fun while following the stream of action we developed from the bankroll. It was not an easy day for players, even creative players like us, and, having been on site and in the thick of the horsemen involved we can tell you it was not an easy day for them, either. First, though, the success, which came in the main event. If you have been following our exclusive Hambletonian Trail blog since May, you know that we have made a good deal of money from this year’s Hambletonian winner while he was heading for the classic. We even liked and wrote about him at two, before he was injured and forced out of the Breeders Crown. Broad Bahn was our Hambo choice and we played him heavily in the Players’ Pool. Defying a strong bias against speed on Aug. 6, he went wire to wire to beat both race favorites and pay $14.60 (pictured left). The race went very much as we predicted. The unreliable gait of the public choice, Manofmanymissions, came into play when that cold challenged the leader, Broad Bahn, in the stretch. Broad Bahn was putting him away when the favorite made a misstep and broke. He finished eighth. The second choice, Chapter Seven, tried to close on a course favoring closers but could not make any progress. The colt we picked for third in the triple, Opening Night, finished third. Unfortunately, our choice for second, Fawkes, broke in the second turn. The place horse, Whiskey Tax, took advantage of the chaos and got the second spot, just holding off Opening Night. The Hambletonian winner was driven by George Brennan. One race before the main event, Brennan came from behind with Bold And Fresh, a huge outsider at 24-1 to win the “Oaks.” She just got there as a swift-closing Lady Rainbow (one of our choices) stormed on the outside to be second at 12-1. Speed would be a victim again in this race, just as it was in races 1 through 7. Things lightened up a bit for the speed horses after the Hambo but bettors were still victims of some close calls. Miss Paris, Big Chocolate, Aracache Hanover, Il Villaggio, Jezzy, Hey Mister, Lady Rainbow, Hypnotic Blue Chip, Androvette, Rock N Soul and Southern Sport. 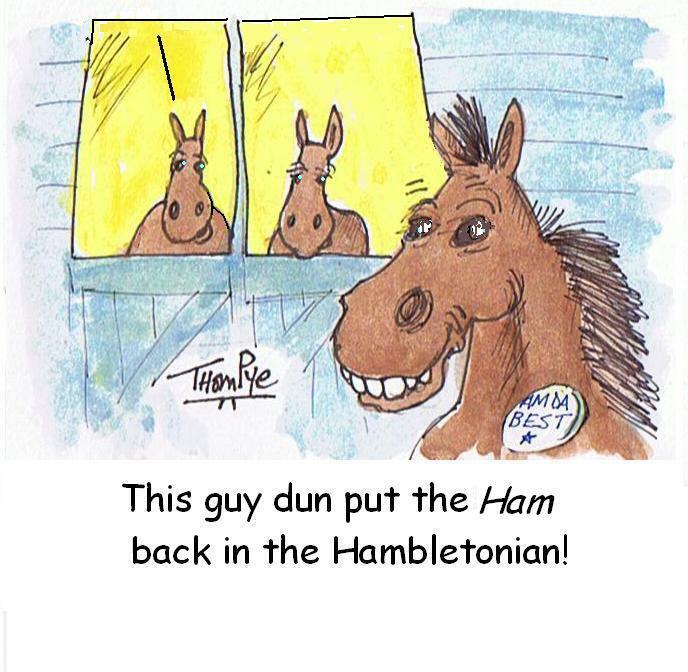 Hambo-day horses are poised to return in other events to get the job done. That you all for following us live on Twitter, though there was some technical difficulty early in the card. Please continue to follow me for all harness updates. Jeff Gural, the man who led the team that would keep the Meadowlands open as it went from a state to private facility, spoke to harness racing industry people representing 17 countries at the World Trotting Conference. He outlined the huge changes that the one-time flagship track will undergo in coming years. He called the Meadowlands “obsolete,” a facility “built for a different era” that is “too big now for the crowds it draws.” Gural talked about the plans that include dismantling the entire structure and replacing it with a modern building to be constructed on the other side of the old one. He offered a graphic depiction of what will be a plant more like the two he runs now, Tioga and Vernon in New York. Many of Gural’s ideas about making the sport more attractive to bettors and fans, ideas he has championed to the industry for two decades, will come to play with the new Meadowlands. He is going to make horses sired by four-year-olds ineligible to major stakes, for one. “We need to keep horses from retiring at the end of their three-year-old season,” he said. Gural is finally getting this concept to become a buzz, asking other tracks and the Hambletonian Society (which handles many big stakes) to seriously consider the policy. Before the Meadowlands closes this season, frosh-colt pacers will battle for the prime prize of summer in the Woodrow Wilson stake. Elims should be necessary and will be held on the penultimate weekend of the meet. It will be the closing feature in two weeks. Glamour-boy pacers’ next contest is the Confederation Cup at Flamboro Downs. This is one of the rare races where elimination heats take place on the same day as the final. We will cover that in our Thursday blog so you can be ready for it on Aug. 14. Plenty of stakes are coming as the second half of the season rolls toward the Breeders Crown events, this year at Woodbine in Canada. Our “Crown” Countdown will begin soon.